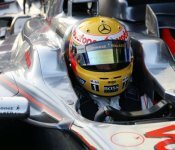 On the second day of testing at the Circuit de Catalunya, Lewis Hamilton was once again on top of the timesheets. He was followed by McLaren team mate Heikki Kovalainen and Ferrari's Kimi Raikkonen. Testing will continue tomorrow.